The Dubai based Al-Bayan newspaper, one of the leading Arabic daily newspapers in the United Arab Emirates, commissioned the office of Tarek Atrissi Design to develop the concept and design of the “Al-Bayan Museum”: a large exhibition space inside the headquarters of the newspaper, that is intended to be the visitor center of the Newspaper; as well as a proud display of the history, archive and the role Al-Bayan has played in the media development locally and regionally. 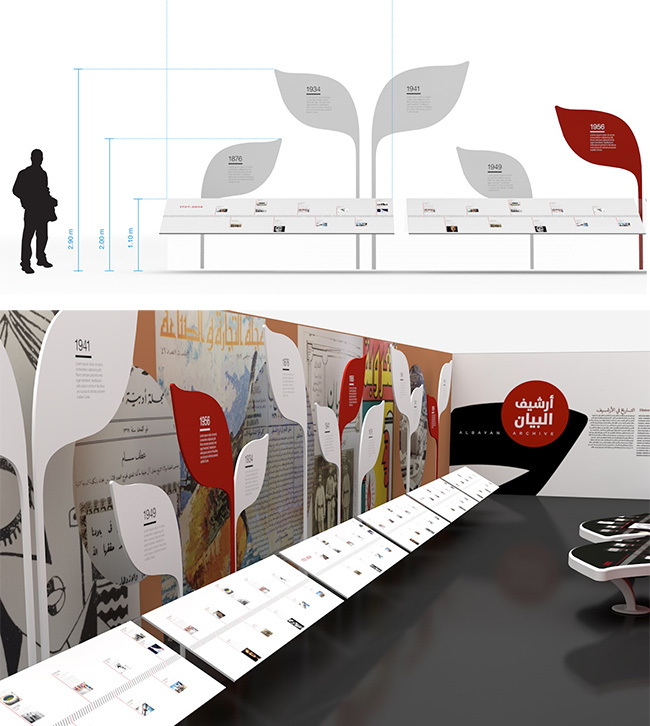 Our tasks for the project consisted of developing the concept design and the detailed design of the exhibition. This included defining the exhibition various section and the circulation of the visitors within it; as well as selecting the exhibition themes and the creation of an engaging narrative content. Tarek Atrissi Design developed the full 3D design of the exhibition, in addition to al the 2D graphics needed for the museum: which included the branding and all the exhibition graphics that had to be bilingual as all content was in Arabic and English. The exhibition consisted of 7 different areas, reached by the visitors in a linear navigation. A general introduction area of the exhibition is followed by an entrance through a gigantic role of newspaper front page, inspired by the printing process of the newspaper. Zone 3 consist of a historical timeline that traces the development of media on two levels: in the Middle East at large; and in the UAE specifically. It creates an informative space about the history of newspaper development locally and regionally. 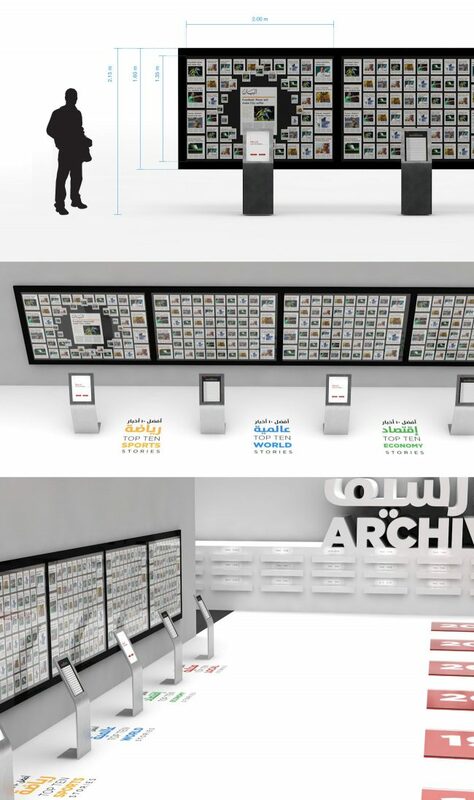 This history zone includes as well two interactive tables that facilitate to the user browsing through the timeline depicting the history of media development in the UAE and the region. 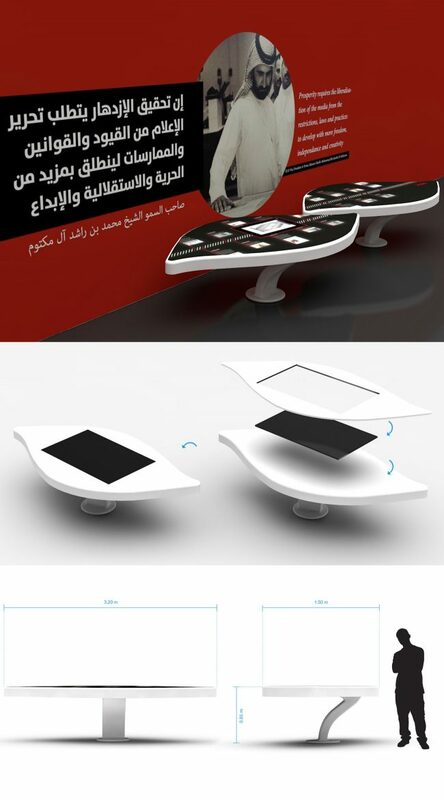 The interactive table allows the users to find the specific information that interest them. Area 4 of the exhibition is the archive zone, consisting of an area focused on the history of Al Bayan newspaper; celebrating the story of the newspaper through its own archive. The first station of the archive display is a walk through the history of newspaper. Eight very large vertical structures will display a key first page of the Arabic newspaper from each 5 years of publishing, starting with the first cover in 1980 and reaching a cover from 2015. A second station in the archive zone is a large bilingual interactive multitouch screen. The screen contains a wealth of stories that are available to the users to choose from and enlarge according to their hand movement, or can be filtered according to topics through an interactive stations controlling the large screen. The third station in the archive zone is a classic archive that invites the user to explore it. Stories in drawers that are labeled by years and topics, the visitor can open any specific era of time to view original prints from the archive. The drawers are lit from the inside for a best display of the printed displayed archive. 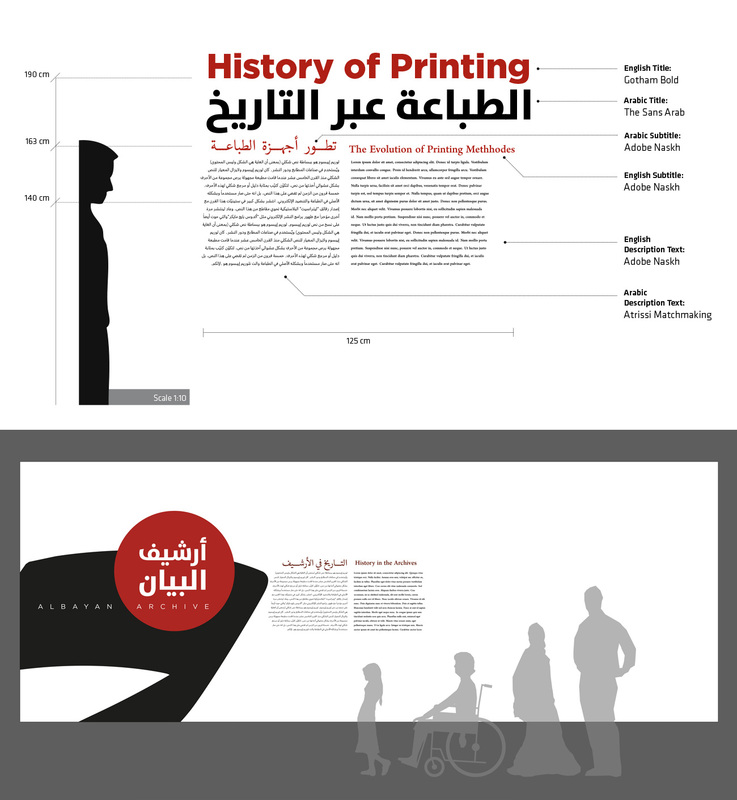 A specific zone dedicated to the history of printing includes different type of displays to showcase various exhibition materials, including historic real scale printing machines used in printing the Arabic newspaper. The following zone is an interactive layout room that gives the visitor the chance to use an interface that will allow him to explore designing the layout of the front newspaper page. 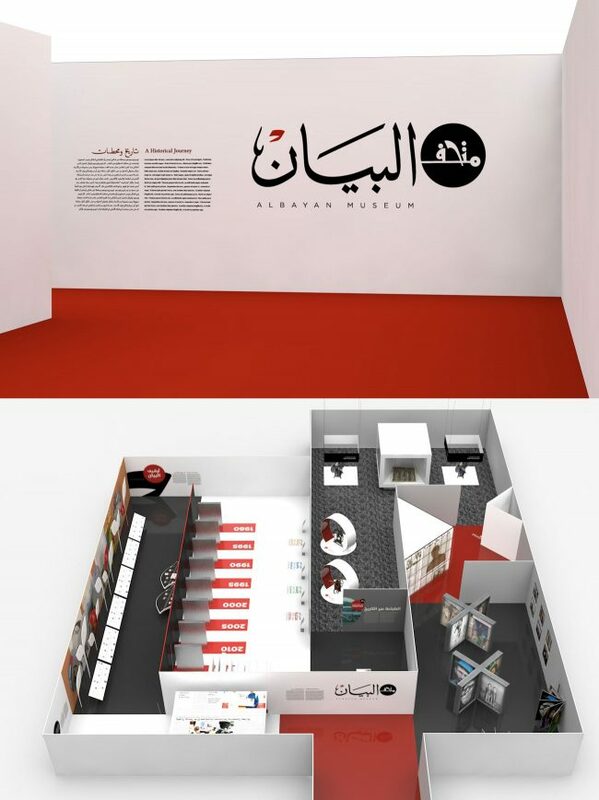 Finally the last zone is dedicated to temporary exhibitions that can change constantly, hosting exhibitions that can relate specifically to Al Bayan Newspaper or that are related to the news theme in general. Curated exhibitions in this area can be the “world press photo” exhibition; or an exhibition about newspaper design excellence from around the world; or a specific exhibition about advertising in Arabic newspapers in the 1980s; among other possibilities. The design of Al-Bayan museum takes an approach that provides the visitor with an experience that is educational, entertaining, Narrative, Interactive & Engaging. 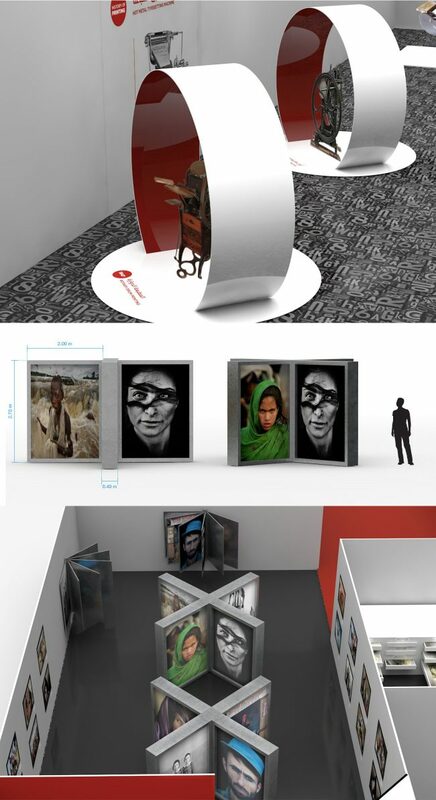 Shown on this page are samples of the 3D rendering of the concept design, and parts of the detailed design, as well as previews of the 2D exhibition graphics specs and guidelines.